Zanele Muholi, the 2013 Prince Claus Laureate, put on what could be best termed a conversation starter of an exhibition during the prestigious Prince Claus Laureate Award ceremony. The Ambassador of the Kingdom of the Netherlands, H.E. Mr Andre’ Haspels was at hand at the Wits Art Museum to honour Zanele Muholi’s contribution to culture and development. The award ceremony was followed by the opening of Love and Loss exhibition at the Stevenson Gallery in Braamfontein, Johannesburg. 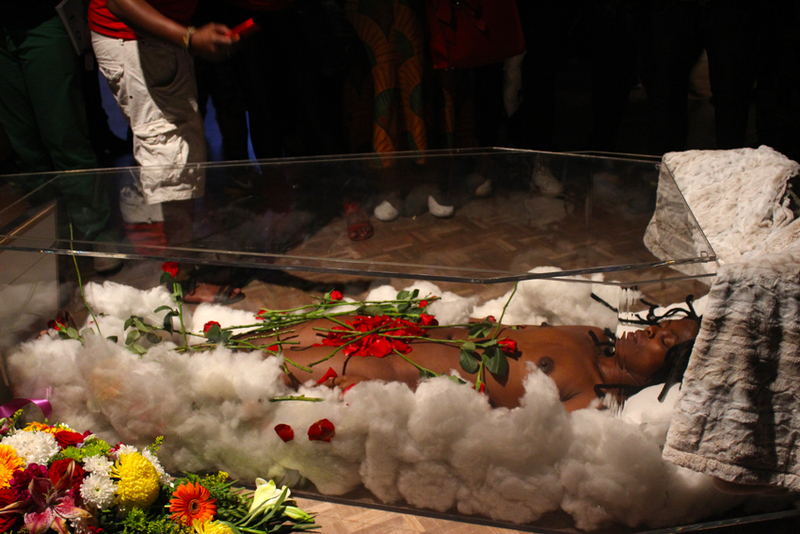 Muholi in a custom made coffin. “If it weren’t for her, we would know each other, but the world would only know us through their eyes and voice, I see myself in this exhibition“. The 14th of February 2014, marks many people celebrating Valentine’s Day worldwide often in the comfort of their homes, but Wits Arts Museum and Stevenson Gallery had a different idea. They brought the broody holiday to the art museum. At 18:30, the museum was buzzing with more than 200 black LGBTI guests, allies and gay patrons from all over Gauteng townships. The majority of them had never been afforded the opportunity to be in in such a space, prior to this moment. The award ceremony and exhibition provided an opportunity to claim a space previously reserved by suppressive ideology, an era past of racial segregation in South Africa that would have deemed the invitees invisible and not worthy of such a space. Now this space allowed us an expression and artistic engagement where we explored and revealed our true being without fear. The prevailing tone in the air was that which acknowledged Muholi as a messiah, who has united us all; black, white, drag queen, Butch, township dwellers and suburbanites in a space where the societal and cultural etiquette was challenged to fit the context of diverse people in the Museum and Gallery, thus embraced the contrasts of love and loss under one roof. The accolade of messiah follows Muholi, who has used her passion to create photography and art as a vehicle that advocates for the emancipation and celebration of the black LGBTI community who are previously and presently marginalized in mainstream media. In documenting and voicing the different queer identities and their multiplicity, Muholi has created a visibility that had been swept under the rug. This new platform has allowed for a celebration of Queer and Trans beauty and existence. The Prince Claus award ceremony boasted colours of love, which were celebrated with struggle songs and chants of freedom and power by the fired up crowd. It became a melting pot of culture and norms as all protocol was abandoned. Songs of freedom were chanted in celebration of a ‘soldier’ who had fought a good fight and was now being rightfully honoured. As she was acknowledged and given the award, the venue was illuminated by prayer and loud singing, using liberation struggle songs which lyrics had been altered to fit an LGBTI context. One could not help but feel part of the revolution that captured the mixed emotions of love, celebration and mourning for those gone prematurely. It is clear that her selfless efforts are driven by the passion to leave a legacy of sorts, that of an empowered and productive black gay and community. Her works speaks to the fact that lesbians should be judged only by their actions and not sexuality, gender or race. When the award ceremony ended at 20:30, the attendees moved to Stevensons Gallery, which was a street away. In numbers lesbians, gays, bisexual and intersex marched in unity, down the streets of Braamfontein in a proud moment of belonging. Upon entering the gallery, all your senses went into over drive as Zanele Muholi’s live performance art installation, threw everyone for a loop and left them momentarily shocked. Muholi was inside a custom made glass coffin, which was strewn with rose petals and shreds of flowers on top of it, as she laid there naked, an allusion of death!! The celebratory mood quickly changed to a sad and a somewhat sombre mood. There were expressions of awe, sadness, and shock. Some people were streaming tears at the sight of Muholi’s “corpse”. The feelings of pain, anger, and fear resurfaced as they were forced to confront everyone’s worst fears – those of losing a child, aunt, sister, friend to hate crimes. Suddenly death was staring us in the face. The reality of losing a friend or lover, a sister or brother registered fully! Others were comforting the shaken ones. The exhibition engages through photography, the love, flamboyancy, identity and changing scope of tolerance towards homosexuals. Through their persistent acts of “Being” regardless of expectation, dangers, ideological and socio-political control. Muholi’s really pushes the boundaries to compel one to think, reflect and engage with not only the plight, but an elated representation of the beauty of queer black gays and lesbians. In her bid and fight to create a space, and mouthpiece in which the beauty and love that exists in Homosexuals is shared with society and the world, where people can understand that we too live, we too love and we too feel. Of Love and loss, engaged patrons as it evoked a myriad of emotions all at the same time. The installation forces one to face the hard truth and in the next instance makes you swoon. Some of the liberating images were of a gay sangoma couple’s wedding, who believe that their union was accepted by the ancestors. Soon after there are images of friends and family mourning lesbians and gays killed in a bid to correct and or diminish their existence. Other images depict love, beauty and metamorphosis of queer and flamboyant and butch identities. Muholi’s work is a celebration of homosexuality, queer identity, and love against all odds and an encouragement to reflect which can be the beginning of healing. In a series of compelling narrative images, Of Love and loss exhibition is opened until the 4th of April 2014 at the Stevenson Gallery, Braamfontein, Johannesburg. Aluta Melvin Humbane was born and lives in Inanda, Durban. He achieved a BA Degree in Drama & Performance and Media & Cultural studies from UKZN Howard College (2012), A Postgraduate Certificate in Education from Edgewood Campus (2013); and a LUCCA International Leadership Certificate. Aluta’s passion for humanitarian work has seen him work in Durban LGBTI NGO advocating for LGBTI human rights and well-being. In past four years has written and directed 2 Dramatic plays which aims to create awareness through shock, the issues of homophobia, woman abuse and negative impacts of a Gesellschaft community. Which has toured Durban and used in 16 Days of Activism campaigns. Aluta is also a singer/songwriter and has braced stages around South Africa. He is also a Playhouse Performer since 2009 till present. He also volunteers at Inanda Community Radio as an art show producer and guest show host. Currently working for Department of Education. He is also working on his first Solo music album “Identity “through his music production co. and directing his Theatre Project, A play called “Mandela could be Jesus” which will open towards end of 2014. This entry was posted in Aluta Humbane, Black Gay Men Write Rights, Collaborations, Collectivism, Committed, Community, Connections, Contributors, Crea(c)tive senses, Creating awareness, Creative writer, Of Love and Loss, Queer Power, Visual Voices, We Are You, We Care, We Love Photography, We Still Can with/out Resources, Writing is a Right, Youth voices, Zulu is a South African language and tagged 2013 Prince Claus Laureate, activism, Aluta Humbane, Ambassador of the Kingdom of the Netherlands, ArtHeals, Arts, ArtSpeak, Ceremony, exhibition, H.E. Mr Andre’ Haspels, Homosexuality, Of Love and Loss, Prince Claus Laureate Award, Review, Wits Art Museum, Zanele Muholi. Bookmark the permalink. (WOW) Out of words ! I didn’t attend. A grave mistake that won’t happen again. Beautiful.